The range of the Green and Black Poison Dart Frog is Central America (Panama and Costa Rica) and South America (Northwestern Columbia). They have also been introduced to the Hawaiian Island of Oahu. The Green and Black Poison Dart Frog inhabits the rain forest floor near small streams. 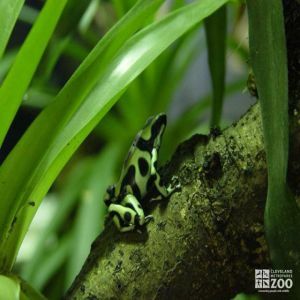 Green and Black Poison Dart Frogs lay eggs which become tadpoles in two to four weeks. Before eggs are laid the male and female green and black poison dart frogs engage in a behavior where they jump and hit each other for two or three hours. Mating is done by amplexus in which the male clasps the female while she lays her eggs. He fertilizes these immediately after they are expelled before the jelly which surrounds them swells. Eggs are laid on the ground and are guarded by the male who periodically sheds water, removes fungus and rotates the eggs (Fungal growth is inhibited by the skin secretions produced by the father, and "shedding water" simply means urinating). The male then attaches the larvae to his back by a mucous secretion and carries them to small pools of water. Here they develop into tadpoles and eventually into frogs by metamorphosis.